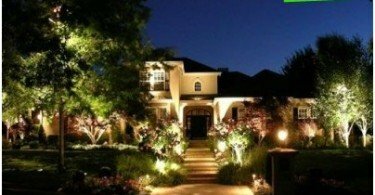 Architectural lighting - a decorativelight facade of the building or any other structure: pool, pond, bridge, gazebo. 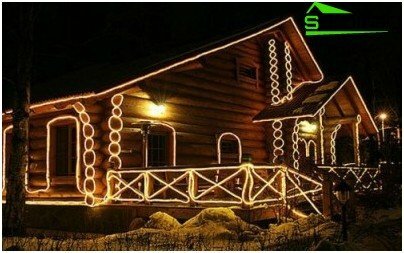 It solves several problems at once - highlights the architectural object, decorate it, creating a festive mood. Also, using this technique, you can create a "presence effect" of people in the house that will help scare nocturnal thieves. The idea was a long time illumination of facades, afterFirst World War. The pioneers in this business have become Americans, cast light on the skyscrapers of Manhattan so well that the American press immediately dubbed the area "City lit castles in the air." 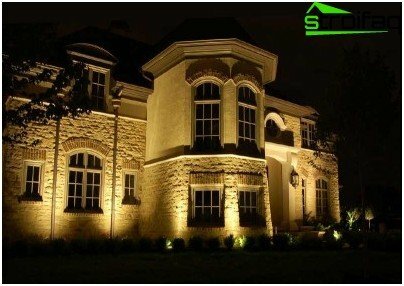 Now this method of lighting has been applied in the private house-building, and can be beautifully illuminate the house of any size - and a three-story mansion with columns and twenty meters a summer house on six acres. Solid color light facade. This option is suitable for large buildings, built of beautiful embossed material, such as natural stone or simulate it. Such illumination highlights the entire building. 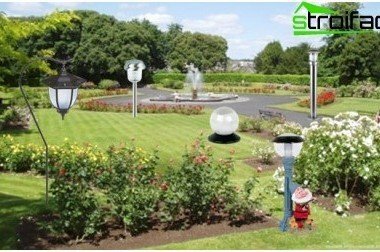 It is executed with the help of spotlights mounted on the ground or on special supports. It is understood that the illumination is designed so that the spotlight does not shine directly into the window. 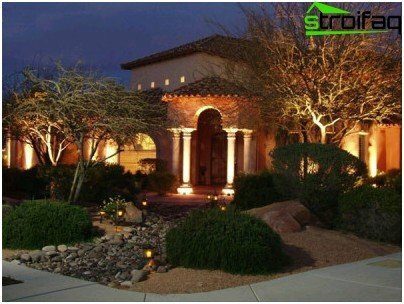 Accent lighting - it is more delicate andcost-effective way to highlight and illuminate the object. The lamps are mounted directly on the front cover and only the most beautiful of its elements - cornices, window frames, balustrades, balconies, columns, moldings. The combination of dark and light areas of profitable emphasizes the architectural merits of the building. It is the most popular option. 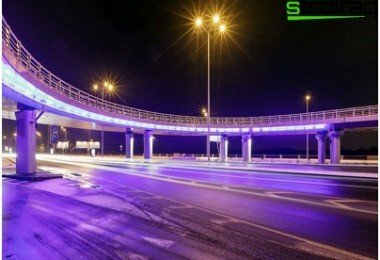 Contour lighting - lighting design is a novelty,which has become possible thanks to the emergence of a new type of lamps: LED strip or flexible neon, representing a glowing cord made of PVC with soldered LEDs inside. It is sold by the meter, it is easy to bend and cut. 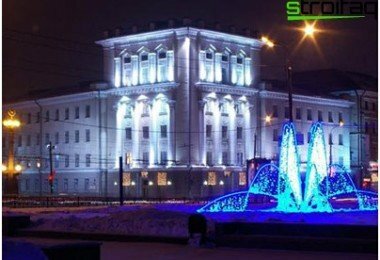 Mounted on the facade is an architectural LED lighting with the help of guides. 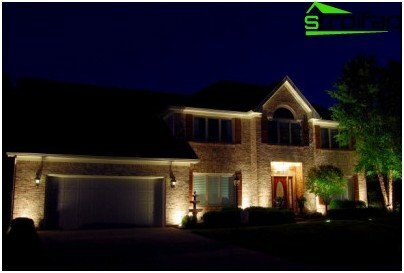 Contour lighting is convenient because it can be used situationally, for example, to decorate the house for the holiday only. Since the maintenance of facadefixtures often difficult due to the altitude at which they are attached, all the equipment must be reliable, easy to maintain and safe from the harmful effects of outdoor conditions. All lighting elements: brackets, lamps, headlights must be resistant to temperature, humidity and dust. In addition, they must issue a narrowly focused light rays. Therefore, special lighting designs developed for architectural lighting and lighting generalist will not work here. 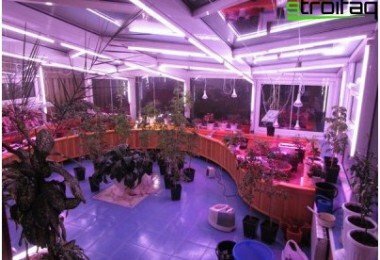 You can not be neglected, and such characteristics asenergy saving and long life lighting. Most of these indicators - halogen and fluorescent lamps. 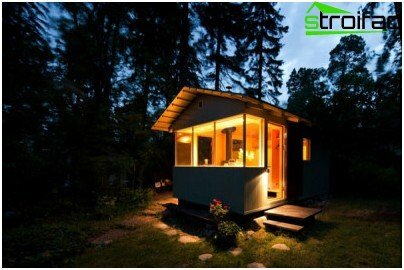 However, most now use LEDs, because they do not have to maintain, and they consume very little electricity. Manufacturers claim that these lamps are 100,000 hours (compared to an incandescent lamp - 1000 Fluorescent - 10,000). But in fact, after approximately 25,000 hours LED dimmed, and it would be better to replace him. Yet, architectural outdoor lighting massive shift to LEDs; very conducive to this is that these lamps fell roughly doubled over the past few years. horizontal upper - upper arches, niches, carport. hang on a rope and send a beam of light downwards. 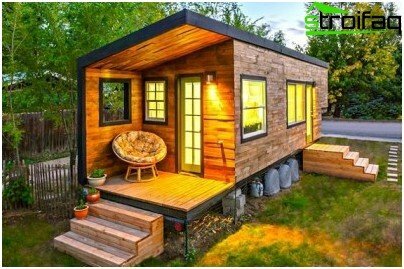 And the last stage - the definition of the nature of light - the intensity, the color, the size of the light spot, whether dynamic effects necessary: ​​change the color of the beam, its brightness, throbbing. 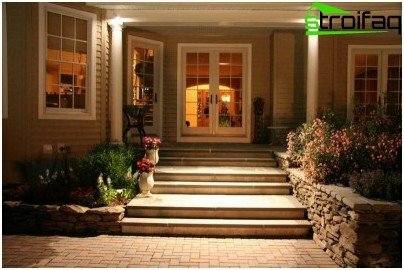 As you may have realized on their owninvent, design and construction of architectural lighting is not always easy, because it requires some special knowledge of electrical and design at the same time. Therefore, if you feel that you do not fail, you can simply ask for help in a company specializing in this type of activity. 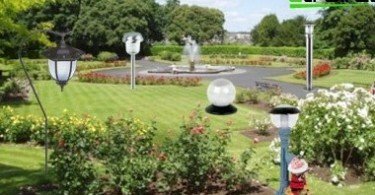 Fortunately, they now have in every major city, because architectural outdoor lighting is now in demand as never before.